I recently traveled to Seoul, and this post is a compilation of 12 of coolest and most interesting places I visited. With shops, cafes, and music stores rounding out the list, there is something for everyone. The only two things this post doesn’t include are Seoul’s best vegetarian restaurants and Unistella, which is a high-end Nail Salon. This list is by no means comprehensive–there is plenty I must have missed. Still, if you’re visiting Seoul, you can’t go wrong by checking out these places. Osulloc is a chain which sells a variety of tea related products. However, by far and away their most popular items revolve around matcha green tea. This is a green tea latte. The white shot glass to the side contains sugar–a necessary addition. Their famous green tea ice cream. This was great, and is certainly the item that should be on the top of anyone’s list. This is the counterpart to the green tea ice cream–black tea ice cream. This is mostly interesting as a proof of concept, as the taste is slightly bitter, and not really as smooth as the green tea. Paired with the right meal, this could provide an interesting counterpoint. However, in the traditional “I want to eat some ice cream” sense, this flavor experiment falls short. Soft serve green tea ice cream. Not as good as the hard, but almost, this is a worthy respite from any hot Seoul summer day. This ice cream was exceptionally cold–perhaps the coldest soft serve I have ever had, which may be a reaction to the extreme humidity and heat that envelops Seoul in the summer. Also worth a try. As a tea store, they do sell a large collection of loose leaf and bagged teas. These are popular! Pirate green tea ice cream. The futuristic, silver building on the left houses the Dongdaemun Design Plaza (DDP). A treasure trove of korean art, design, with a smattering of restaurants thrown in for good measure, the DDP is a worthy visit for anyone in Seoul longer than a day or two. The buildings on the right are large clothing stores, with floors and floors of fashion–generally off brand, but with some notable exceptions. NOTE: It seems the DDP shops are closed on Mondays! Plan accordingly. The DDP in the daytime. One of the many boutiques inside the design plaza. Lots of interesting tape available for sale. This is a special part of the DDP which sells ceramic cups, plates, bowls, etc. This was my favorite section of DDP by far. Located in the middle of the shops, this is a truly must visit location. If you had to choose between the DDP and Highhand Korea, I would go with the DDP. One of the finer works available. An interesting collection of cats. On the other end of the cultural spectrum is a large K-Pop store, selling items dedicated to teen idols and pop stars. Apparently nobody realized the irony of 9 players in football uniforms wearing baseball hats. A beautiful, modern store which serves as a landmark for music lovers in Seoul, Vinyl and Plastic is a fun visit. This must be the capital’s most comprehensive collection of physical music, and it is a collection that would be impressive in nearly any city. Albums on display at the entrance. A large collection of colorful headphones adorned one wall. CD’s are sold on the second floor. Strange to think they too are now old. The second floor doesn’t just sell CD’s–they have a DJ and a cafe! Those women are enjoying coffee bought just steps away, while the DJ creates a soundtrack for the store. On the second floor, by the window, you can see CD’s spin–assuming someone is listening to it. Yes, these CD’s are linked to different headphone stations around the store. Location: Take exit 2 from Itaewon station and walk east on the main road, continue as it curves, and Vinyl and Plastic will be on your right. Here’s their Facebook page, with a Korean address/map link. Pro Tip: Vinyl and Plastic is near the first branch of Pizza D’Buzza, a great pizza place which made our list of best vegetarian restaurants in Seoul. Take this opportunity to stop in, or backtrack to Itaewon station and hit Plant, a vegan place which is on the same list. A great fermented apricot granita. Really great and refreshing, especially on a hot day! The location of Space Shinseon can be found on the map in the Vinyl & Plastic entry. The multi-story Line Friends store in Itaewon, complete with a cafe on the third floor. For those not in the know, Line is a chat app. The “Friends” are cartoon characters which you can send to other people you’re chatting with. Although internet companies were once predicted to destroy physical stores and even physical interactions with others in the real world, instead they have led to a wildly popular collection of stores. It’s truly amazing that a chat application has gotten so popular that a real world store selling merchandise based off an app is a profitable concept. Expect to find hordes of teenagers and twentysomethings taking loads of selfies. There is a line to take a photo with the giant bear. In a sense, this is precisely the reason why you shouldn’t go to Line Friends. Yet, there is still value in seeing a cultural phenomenon firsthand. Locations: There are various locations in places like Myeongdong, Dongdaemun, Hongdae, and more, all of which can be found on the Line Friends website. A map of Itaewon, including the local Line Friends location is included above, with the Vinyl & Plastic entry. Highhand Korea is a chain of stores selling traditional Korean crafts, including chopsticks, boxes, shelves, etc. This photo was taken at their Seoul Station shop, but the rest of the photos in their entry were taken at their Itaewon store. Strangely, these chopsticks were priced at 130,000 Won here, but were priced at 150,000 Won at their Itaewon branch. 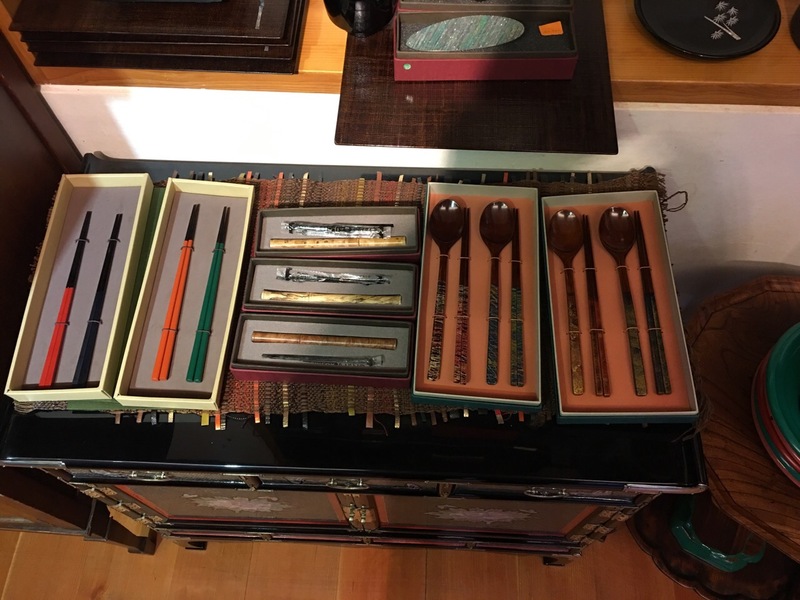 The Dongdaemun Design Plaza also sold these chopsticks–for 200,000. I guess it pays to shop around. A large collection of beautifully crafted work, including bowls, plates, and coffee tables. This is an amazing dresser. Given the prices of the coffee tables below, I didn’t even ask for a quote. The photo just doesn’t do it justice–in person it sparkles. These beautiful coffee tables cost nearly $5,000. When you visit Korea, expect to be told that Korea is the only East Asian country to traditionally use spoons. Of course, China and Japan had their own type of spoon, but it looks different from the Western or Korean ones. Itaewon Branch (HQ): This shop is located very near the Danish Embassy. Here is a map. 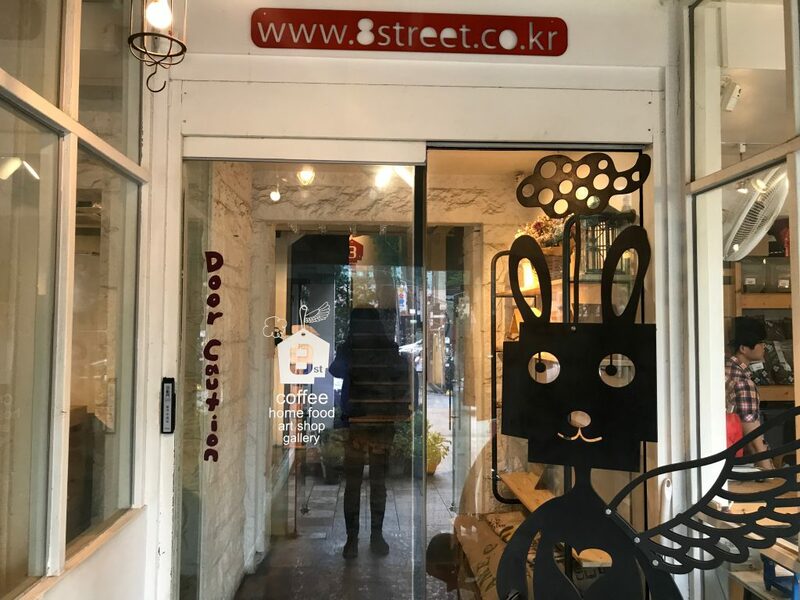 A cafe with bingsu, beer, desserts, and, yes, coffee, 8 Street not only offers guests a nice place to study, but also hosts occasional concerts. We stopped in for an acoustic performance. It really had that earnest feeling of youth. Years ago I had some great coffee from Yemen there. Not available anymore, sadly. I found out about Seoul Forest from this Time Out Seoul article. It is a very interesting area which combines a modern apartments and offices with outdoor space. This creates a feeling of space which is unusual for a city of Seoul’s size. It also reveals the possibilities for dense housing surrounded by nature, combining some of the best aspects of city life with the relaxed feeling of the outdoors. The towers are already very well done, and this extends to the interior as well. This is the interior of the tower on the right in the preceding photo. Inside are offices and an art gallery–with some very nice paintings. This tower feels like the future, and the solution to the endless sprawl which seems to define so many cities in a poor way. Inside is a pasta place with the same concept as this Venetian to-go pasta place. Meme or rip-off? Imitation or innovation? Outside the towers is a park with a mix of terrain and, in some parts, multiple sculptures. The idea could be pulled off better, but the concept is fantastic and it will probably only get nicer. The edges of the park are cut by freeways, which is unfortunate, but nearly inevitable for a park located in a city of this size. An art gallery inside a tower displayed this painting, which was truly fantastic. It really captured the evocative spirit of candles at the end of the day–or perhaps the middle of the night. Sobang life, featured in the post about Seoul’s best vegetarian restaurants, is located here. Butter is a fun chain store with a sort of fun quirkiness which I expect would, in the western context, be expressed instead as irreverence. The entryway, with mildly provocative, naked dolls. A sampling of the goods inside. It sort of reminded me of Tiger, a chain popular in Scandinavia. One of the cuter objects for sale. A melting clock. Eat your heart out, Dali. A small dessert shop amidst the cute and trendy shops of Samcheongdong, the standout attraction here is the persimmon bingsu, pictured on the left. This is a cold sweet rice dessert. While it was tasty, I would’ve preferred it to have more rice, and be slightly less watery. This was–as I recall–a walnut and, perhaps, date pancake. Unfortunately it was just okay–but none of it mattered, since the Persimmon ice cream was so great. Jeffrey Cafe is a beautiful flower shop and cafe in Hoegi. The ambiance is fantastic, and the drinks are good too. This drink, is essentially a mashed up grapefruit in a pitcher to which you add Perrier sparking water. A simple concept, but one that really tastes very good. Also on the menu is a lemonade topped with cotton candy, and several fruit smoothies. There is also a shaved ice desert topped with the Korean powder, which was actually quite good. Probably the best dessert award has to go to to this mango smoothie/ice cream concoction, which not only looked amazing but tasted great as well. Seoul is an amazing city with lots to do. In addition to the places I mentioned, be sure to check out our write-ups on the best vegetarian restaurants in Seoul. Many of them are so good you’ll want to go even if you eat meat! Also, check out our post on Unistella, a great creative nail salon. Moreover, there are many places in Seoul you’ll want to check out that I didn’t write about. From shopping to Myeongdong to taking a day trip out to see the DMZ, there is so much to do. And don’t miss Brandon Belknap’s stories about Tokyo and Iceland. If you have a long plane ride ahead of you, definitely consider getting the Bose QC35 headphones–they will change your life. Summer is nearly upon us, but don’t get too warm just yet. This amazing documentary shows master Latvian woodworker Rihards Vidzickis building a dugout canoe….